This easy Mini Chocolate Pecan Pie Cheesecake recipe is a fun twist on a classic pecan pie! So, I’m going to get a little controversial today. I know a lot of people are all about pumpkin flavored everything once fall hits but I’m really more of a pecan girl. Don’t think less of me! I grew up in the south and my grandma had a pecan tree in her backyard. I grew up eating pecans straight from the tree, or better yet in a homemade pecan pie straight from grandma’s oven! Now that I’m all grown up and I do my own baking I use pecans in all sorts of recipes from my Pecan Pie Cake Roll to my Apple Pecan Stuffing. With the recent change in the weather (I love fall weather!!) I have been inspired to start my fall baking and the first thing I tried out was this amazing Mini Chocolate Pecan Pie Cheesecake. The name speaks for itself, I mean how much better can you get that chocolate, pecan pie, and cheesecake all baked into one delicious dessert? 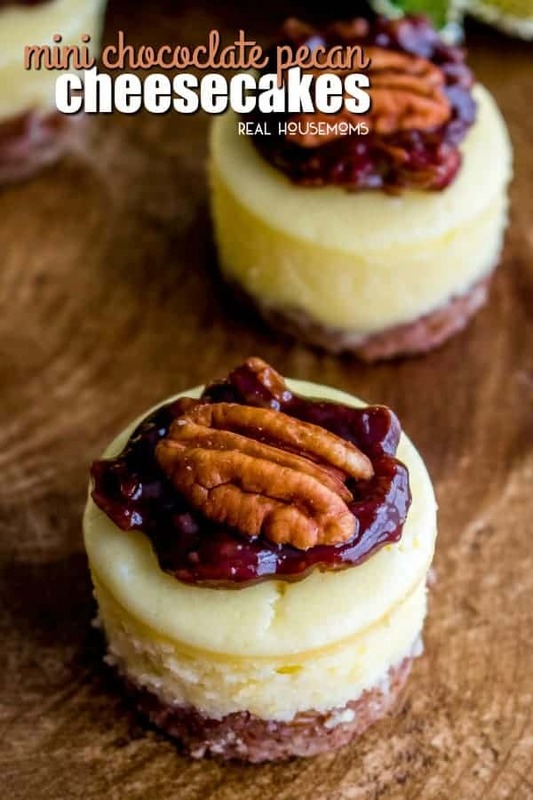 These Mini Chocolate Pecan Pie Cheesecakes are a simple cheesecake mixture made with cream cheese, sugar, eggs, flour, and vanilla baked on top of a pecan crust. That alone is pretty darn delicious but the real star is the dollop of chocolate pecan pie filling on top. The pecan pie filling is just like my mom, and my grandma before her, uses for her pecan pies but instead of pouring it into a pie crust and baking it I cook it on the stove top until it thickens and then at the very end you add a handful of chocolate chips and…well it’s pretty awesome. After the cheesecakes cool, I add a little bit of chocolate pecan pie filling to the top of each. You don’t need much, a little less than a tablespoon, it’s pretty powerful stuff! When you get a bit of everything all together it is pretty much heaven. 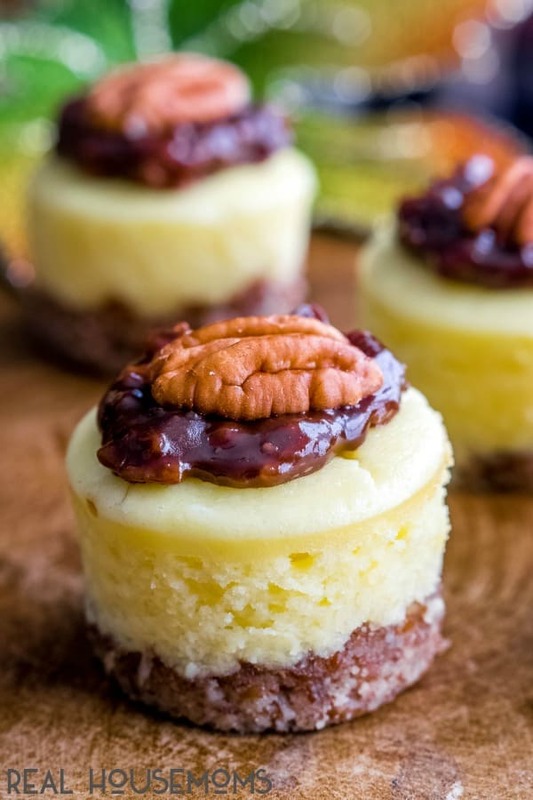 The pecan crust and the cheesecake cuts the sweetness of the chocolate pecan pie filling and everything melts together into one perfect bite. If you aren’t a pecan lover before you make this Mini Chocolate Pecan Pie Cheesecake you will be when you’re done! Mini Cheesecake Pan: This pan is my favorite for making perfect mini desserts! Tamper: This handy little tool is great for espresso of packing the crust of the favorite baked goods into place! 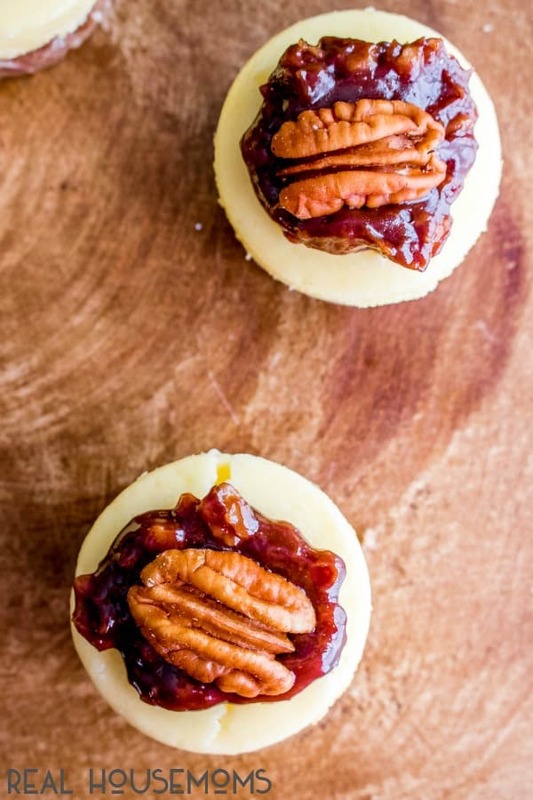 These easy Mini Chocolate Pecan Pie Cheesecakes are a fun twist on classic pecan pie. Melt butter and add crushed pecans. Form the pecan mixture into 1 inch balls and place them in your mini cheesecake pan. Use tamper to firmly press the pecan ball in to the bottom of the mini cheesecake pan (or muffin pan). Pour cheesecake mixture over pecan crusts, filling each tin almost to the top. In saucepan over medium high heat stir sugar, corn syrup, eggs, and butter together. Bring to a boil then reduce heat cooking for 5-7 minutes or until it begins to thicken. Remove from heat once it has thickened. You can test this by stirring it with a spoon and seeing if it coats the back of the spoon. Add the vanilla, pecans, and chocolate chips stirring until the chocolate has melted. Remove cooled mini cheesecakes from pan and the spoon mixture over the mini cheesecakes. Your instructions call for honey granules, but there is sugar in the ingredient list, not honey granules. Please clarify.